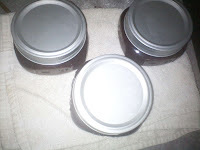 Well since EVERYBODY is canning these days I just had to throw my hat in the ring - I asked my friend erin and she sent me to a website (pickyourown.com) and originally I was going to pick the peaches but I decided to start with something a little easier for a first item - so I made some triple berry syrup... I used Splenda as my sweetener and according to Jim YUM YUM YUM! Glad it came out well! Isn't canning fun? It is SUPER fun! Would you like to get together sometime and can some stuff?